Need more material for your craft projects? Enjoy 10%* off your purchases with min. 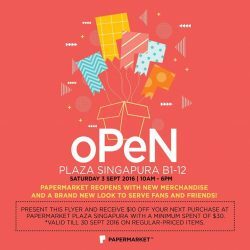 $30 spend at PaperMarket Plaza Singapura when you present this flyer. 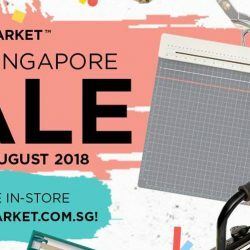 and the GREAT SINGAPORE SALE is now on! 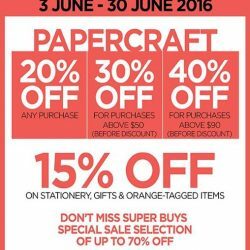 Visit our stores to stock up on your favourite and newest paper crafting supplies, gifts and stationery! We're having a preview sale for all VIPs! From now to 3 June, enjoy discounts for your purchases in PaperMarket. Drop by now! 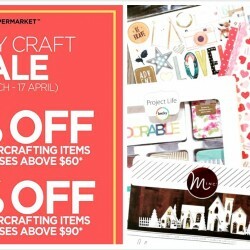 If you are an avid scrapbook maker, dun miss the crazy craft sale at PaperMarket with up to 40% off all papercrafting items from now till 17 April 2016! If you are not, why not start a new hobby today? Head down to PaperMarket Raffles City and Plaza Singapura now! 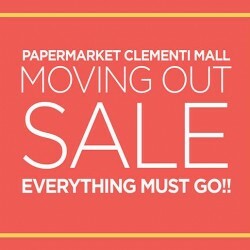 Enjoy this moving out sale now on at PaperMarket Clementi Mall! Grab your supplies at a great discount. Check out their blog for more details! 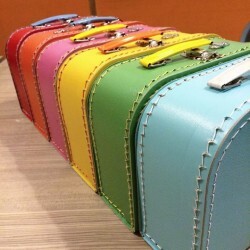 Check out the whole range of paper suitcases they have at PaperMarket Plaza Singapura! Moreover, get 20% off these suitcases from now till end of December (Exclusive at their outlet in Plaza Singapura). If you're looking for a special way to 'wrap' up your presents, why not pick up one of these colourful and super useful suitcases! 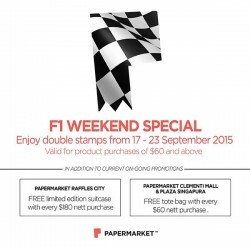 PaperMarket’s offers F1 weekend special Double stamps. Valid for product purchase $60 and above. Save the date this 27th June 2015 for some fun and excitement. Mark your calendar now! 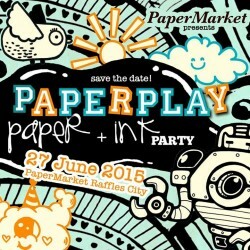 to enjoy paper+ink party @ papermarket raffles city. 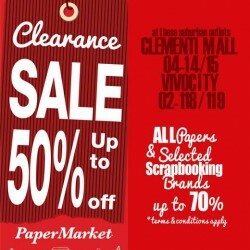 Suburban CLEARANCE SALE up to 70% off all papers and selected scrapbooking brands at PaperMarket! It's too good to miss! While stocks last! Terms and conditions apply. 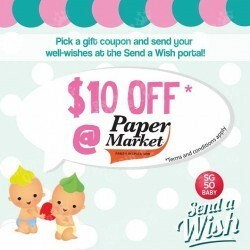 SEND A WISH along with a $10 PaperMarket voucher with their compliments! How's that for a wish tagged with a shopping treat. To do so right away, visit heybabysg on Facebook. Terms & Conditions apply. 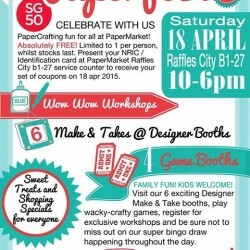 PaperCrafting fun for all at PaperMarket! Absolutely free! Limited to 1 per person, whilst stocks last. Present your NRIC/Identification card at Papermarket Raffles City b1-27 service counter to receive you set of coupons on 18 Apr 2015. 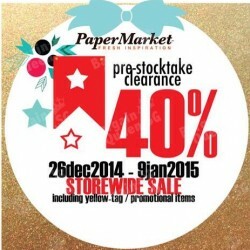 PaperMarket offers CNY Special at 38% off with min. 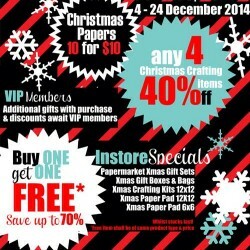 $88 purchase of papercrafting supplies and excluding adhesives and local brands max 20% for promotional priced items this 20 to 24 February 2015. 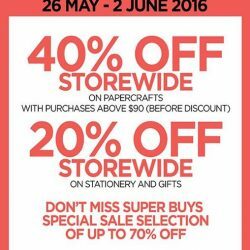 YES, the big 40% STOREWIDE* discount has started at PaperMarket! New arrivals & "NETT" labelled items are not eligible for the promotion. The Season Of Giving is kicking in & it's still not too late for Christmas shopping @papermarket! Plus be prepared to be Awed & Inspired as the NEW Collections from American Crafts & others are up on shelves! It's a MUST-HAVE-IT Weekend! 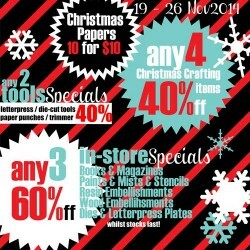 Festive Season SALE @ Papermarket! Plus HOTTEST NEW ARRIVALS now! 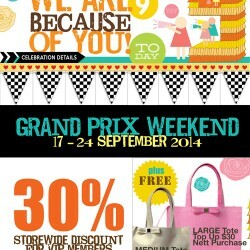 Enjoy 30% STOREWIDE SALE this F1 Weekend at PaperMarket! 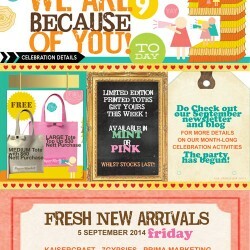 PaperMarket Blog – Be inspired by Fresh News on Unique Stationery New Arrivals and promotions!